Ok, I'm still on trying to receive wallpaper videos. What I found is that qml may be the solution. So I installed the qt-creator package from Sabayon repo. Let me tell you, I have no idea about qt and / or qml. Sure, I found some 'beginners' qt / qml sites, but these are to far for me to understand to hard for beginners. I'm not sure, which version of qt itself is installed (maybe 4.8 and 5.x at the same time). So, what can I do? Where are those 'kits' in Sabayon repo, what is the packages name? Last edited by linuxfluesterer on Fri Mar 02, 2018 16:00, edited 1 time in total. Hm. What happens if you launch the application from a Konsole/Terminal? Can you share the output from there? Ryuno-Ki wrote: Hm. What happens if you launch the application from a Konsole/Terminal? Can you share the output from there? I'm not sure, which application you mean. I just started the qtcreator by menu but within using and creating a new project (app?) I get this message, that there kits are missing. So I can not create any project and cannot create any app. "Das Kommando \"/usr/bin/g++\" wurde beendet, Rückgabewert 1." "Das Kommando \"/usr/bin/gcc\" wurde beendet, Rückgabewert 1." ...then qtcreator environment is opened. I want to remind, that my goal is still to get a video wallpaper login, which I read, is run as a qml-program. So , qtcreator should help me to understand and make run at least a simple qtm (qml?) program. But, maybe the solution for a wallpaper video is here. I read that plasma needs to be compiled with qt-flag enabled. Go to Tools -> Options.... Select Build & Run on left. Open Kits tab. You should have Manual -> Desktop (default) line in list. Choose it. 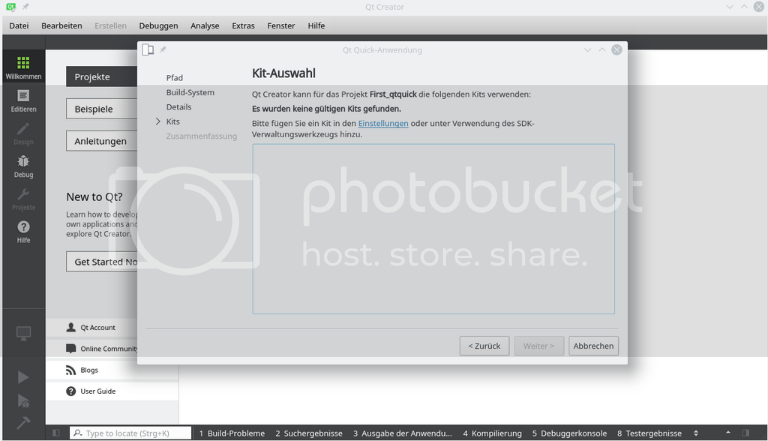 Now select something like Qt 5.5.1 in PATH (qt5) in Qt version combobox and click Apply button. From now you should be able to create, build and run empty Qt project. I didn't get it before, and I had to scroll down to PATH before I saw it and could change to qt5. Now I assume, I'll be able to write some very easy qt5 mini applications. Do you think, this could finally help me to find out how I can receive video wallpapers? I read, video wallpapers are run with qml. This is only going to help if you actually intend to do some programming with qt-creator. As far as running things with qml, you shouldn't need qt-creator at all. Stupot wrote: This is only going to help if you actually intend to do some programming with qt-creator. As far as running things with qml, you shouldn't need qt-creator at all. The qt-creator was such an idea to test if and how videos could be run with mentioned qml used for video wallpapers. In between my problem with this topic (video wallpapers) is solved.